Our premium lamb pelts add a wonderful decorative and functional touch to your home. Each pelt has unique coloring, texture, shape, and size. Shop here! Lamb pelts add a wonderful decorative and functional touch to your home. Drape one of our pelts over a rocking chair or a sofa for a rustic yet refined touch. A large multicolored pelt makes a bold statement in front of a fireplace. Or try a soft, white pelt as a bedside rug - perfect for your toes on cold mornings! And don't forget your faithful companions—Shepherd's Lamb premium lamb pelts make excellent crate or bed liners for dogs and cats. 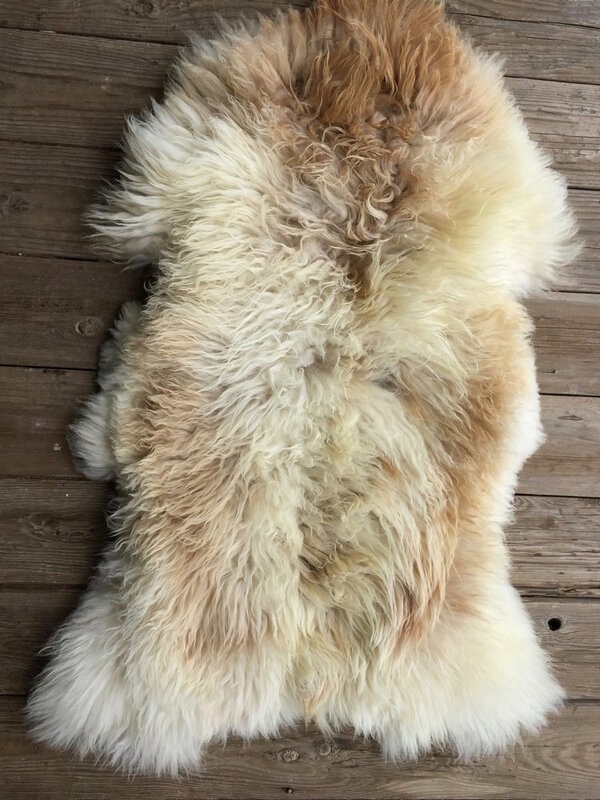 Each Shepherd's Lamb premium lamb pelt has unique coloring, texture, shape, and size. Check out our ever-changing selection of pelts on our Shop page! *Note: Our pelts are processed at Bucks County Fur Products in Pennsylvania. Bucks County Fur does not offer certified organic processing. We have thus far been unable to find a feasible organic processor for pelts. For this reason, our pelts do not fall within our organic certification.